Brooklyn Wainwright is thrilled to be appearing on the San Francisco edition of the hit TV show This Old Attic as a rare-book expert and appraiser. Her first subject is a very valuable first-edition copy of the classic children's story The Secret Garden, which is owned by a flower vendor named Vera. Once she hears what her book is worth, Vera is eager to have Brooklyn recondition it for resale. But after the episode airs, a furious man viciously accosts Brooklyn, claiming that Vera found the first edition at his garage sale, and he wants it back—or else. Brooklyn is relieved that she's put The Secret Garden in a safe place, but Randolph Rayburn, the handsome host of This Old Attic, is terrified by the man's threats. He confides in Brooklyn that he fears he is being stalked. He doesn't know who might have targeted him, or why. In the days that follow, several violent incidents occur on the set, and Brooklyn is almost killed, leaving both her and her security expert boyfriend, Derek, shaken. Is someone after Brooklyn and the book? Or has Randolph's stalker become more desperate? And then Brooklyn visits Vera's flower shop...and discovers her dead. Is the murderer one of the two obvious suspects, or is something more sinister—even bizarre—going on? Brooklyn had better find the clever killer soon or more than her chance at prime time may be canceled...permanently. "Captivating... The action builds to a surprising final showdown." "Top Pick! An engaging look at the world of antique book appraisal and how far people will go to get rare books. The characters are like old friends who readers will enjoy catching up with." 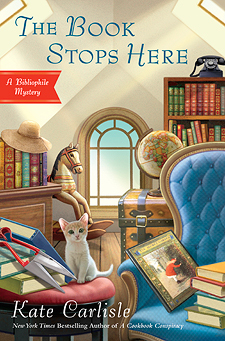 "A smart story with a savvy sleuth—and a celebrity-obsession angle—it's bound to please." "Kate Carlisle does a masterful job of weaving romance, suspense, humor and beloved books into a plot that keeps you guessing until the very end." "Interesting details about rare editions of various titles and their appraisal, as well as facts about bookbinding and rare-book restoration, are woven throughout this satisfying installment of an ongoing series."